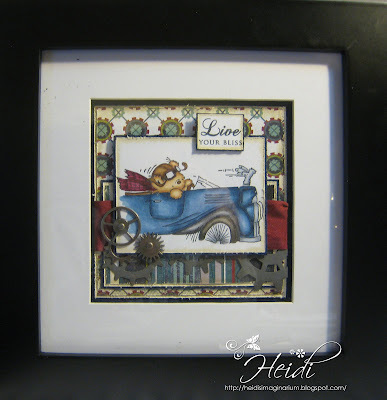 One of my favourite challenge blogs is Sweet Sketch Wednesday. Each week Arlana brings us such incredible sketches. The design team members are fabulous and leave such wonderful comments on my blog. I am excited to tell you that last week I won the Grand Prize! You can see my card here. This week I have another cutie to show you. My dad and brother see all of my creations. My brother, a motorsport freelance photographer, is convinced that some of the car creations could be sold to car enthusiats. It was suggested by some of his collegues that if I frame them, they could be sold as little works of art instead of as cards. I have been trying out different frames to see what would look the best. I settled on a frame from my local craft supply store Michaels that is very close to the look I want to achieve. I am going to use the same vendor that my brother uses to frame some of his real car photographs. They are higher quality and made in America. Please excuse the bits in the frame (I didnt clean the frame before I framed it). And I noticed the ribbon bunched up on the right side. Things I'm not used to since I don't work with frames much. I used the sketch from Sweet Sketch Wednesday, but I flipped it, moved the "flower" to the left side and added a sentiment. The black is the outer part of the frame. 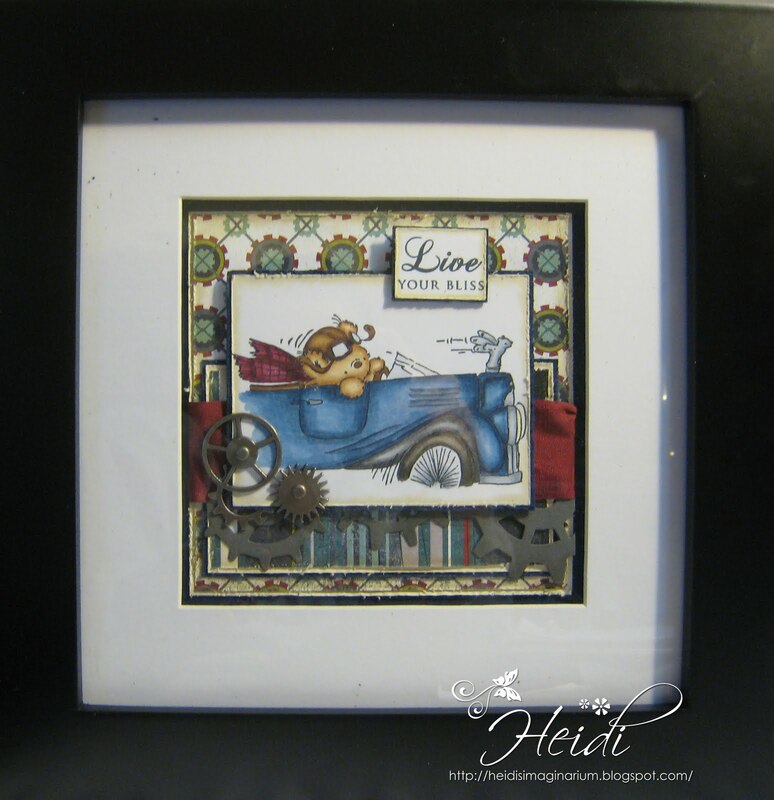 Accessories: Tim Holtz Gaget Gears borders die, Tim Holtz Gears, May Arts Burgandy Ribbon, Frame from Michaels. Hi Heidi, Wow! This is just awesome and I hope you do well with these for the car enthusiast. Congrats on your challenge win. Fabulous, beautiful card Heidi and love the sweet image. Wow Heidi, I have always felt that our cards are works of art...and especially yours. You do wonderful work. This is such a wonderful idea. Such a great take on the sketch this week. Congrats on winning the grand prize this week. You really had a gorgeous card. Hi Heidi, I've been meaning to send you an email to congratulate you on your win last week you so deserve it as I just adored your card loved the colours. This weeks card is also awesome your brother is so right that you will be able to sell them the guys will love them and the women will by them for their partners. I love your card this week and the frame looks pretty good as well. Congrats on the win Heidi!!! This one is super-duper awesome. I love the metal bits - perfect for this card. Thanks so much for playing at Sweet Sketch Wednesday. Heidi, we always love to see your cards! Congrats on winning last week! This card is incredibly awesome. I love the added embellishments to your car! Clever! Heidi your card is just so sweet this week. Love that image and sweet papers. Arlana@SSW!! !